This entry was posted on 29/11/2011 at 11:23 AM	and is filed under Exchange 2007, Exchange 2010. You can follow any responses to this entry through the RSS 2.0 feed. Both comments and pings are currently closed. I believe this will have affect on the way NDRs are sent as well. Can you check if that’s the case? 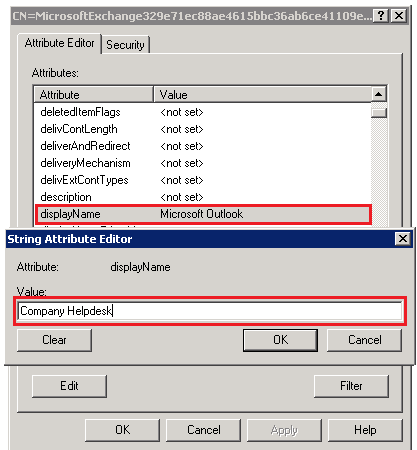 When an NDR is sent to an internal sender, the NDR is sent from the Microsoft Exchange Recipient. The Microsoft Exchange Recipient is a special recipient object that is used by several Exchange 2007 features to provide a unified and well-known recipient that users can use to differentiate system-generated messages from other messages. By default, messages that are sent to the Microsoft Exchange Recipient are ignored and not delivered. For messages that are sent to the Microsoft Exchange Recipient to be delivered to a mailbox, you must associate a mailbox with the Microsoft Exchange Recipient. You are correct, Nilesh. This change will indeed affect the Display Name of the sender that is used for sending NDRs within the organization. Display name on external NDRs would depend on what settings you have on your email gateways.